Measuring and monitoring health inequalities is central to public health practice. By measuring health inequalities, or differences in health outcomes, we come closer to understanding the extent of health inequities, or those inequalities that are systematic, avoidable and unfair. With solid data about inequalities, public health is in a better position to design and implement interventions that reduce inequities. 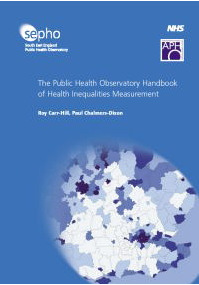 Published in 2005 by the South East England Public Health Observatory (SEPHO), this book is designed to assist people who are working at the local level measure and monitor health inequalities in their regions. It provides methodological advice about different types of indicators (e.g., geography, socio-economic status), and data sources (survey data, administrative data), among other topics. The book has 11 sections, which include: measuring inequality by social category; using administrative and survey data to measure inequality by health and disease categories; designing surveys to measure inequality; and understanding indexes of deprivation. While the content is England- focused, this resource has a wealth of information for those doing the same work in Canada. The English Public Health Observatories were launched in 2000 with a mandate to support the availability and use of information about health by local public health organizations, a role similar to that of the National Collaborating Centres. More information about SEPHO is available on their website. learn how to design surveys and use survey data and indexes of deprivation to measure health inequalities. Carr-Hill, R., Chalmers-Dixon, P. (2005). The Public Health Observatory Handbook of Health Inequalities Measurement. Oxford, UK: South East England Public Health Observatory.